One of my new hero’s in life is Jennie Brown – a woman who gets up at 5am in the morning to start the ovens and mixers in her cupcake workshop. Aside from her regular lovely cupcakes, it’s good news for many people with special dietary requirements. Coming from a family of coeliacs, Jennie knows there is a demand for good quality gluten-free products and has purpose-built a gluten-free room, with separate oven and mixers, in her workshop in Galway. She bakes fresh every day, weighting, measuring, cracking, sifting and stirring every single thing she makes, with any unsold stock at the end of the day going to the Galway Soup Kitchen. Jennie may also, well be the mad professor of cupcake flavors, it’s a surprise what flavors are available every day as she is always working on new ones. Bubble gum, tutti fruti, champagne, candy floss, jaffa cake and cheesecake to add to her established repertoire of victoria sponge, red velvet, cookies and cream, mint aero, strawberry sundae, mars bar and chocolate nutella to name but a very small few. Her rocky road cupcakes are a firm favorite with my family, so if I can’t get to her shop or any of the outlets she supplies, this is the version I make at home. 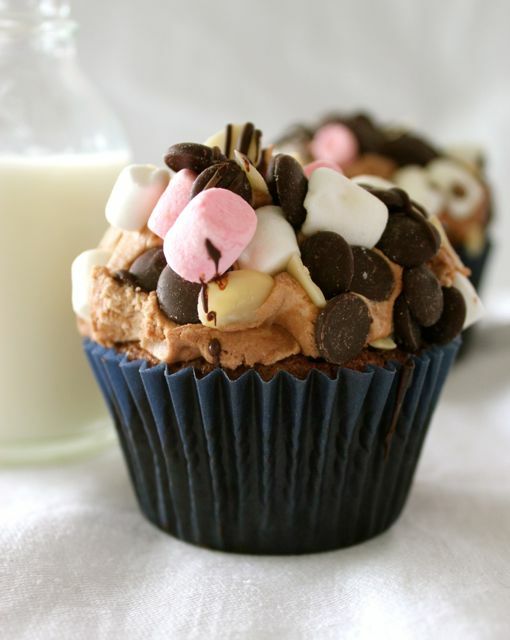 I like eating these cupcakes warm, when the chocolate chips and marshmallows are still gooey in the sponge! If you want to ice and decorate you must leave them to cool completely on a cooling rack. 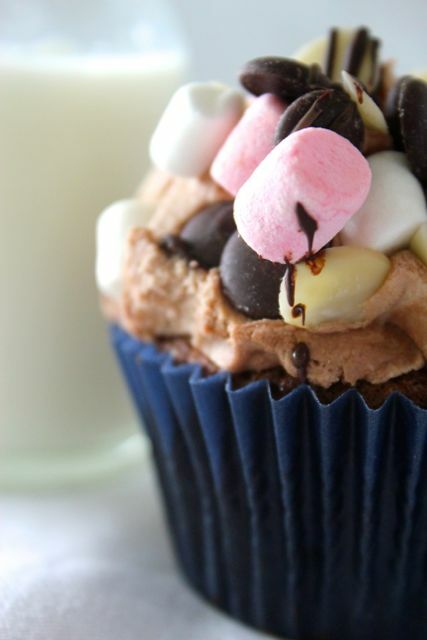 I top my rocky road cupcakes with a smear of chocolate fudge icing, and then press all manner of traditional rocky road ingredients into it and leave to set. However you eat them, I hope you enjoy them as much as we do! Preheat oven to 200°and line a 12-hole muffin tin with paper cases. Sift together the flour, cocoa powder and salt into a large mixing bowl. Stir in your chocolate chips, caster sugar and marshmallows. Place the eggs into a large jug/bowl and beat lightly, then add your milk and butter and beat again. Make a well in your dry ingredients and pour the liquid beaten ingredients in, stir this mixture in gently until combined, being careful not to over mix it. Spoon the batter into your cupcake cases in the tray and bake in the oven for about 20 minutes or until risen and firm to touch. Leave to cool for five minuets in the tin and then on a wire cooling rack. Melt the chocolate in a bowl over a pan of gently simmering water. (or melt in the microwave for a minute) When melted, beat in the butter until smooth, then gradually beat in the icing sugar to give a soft fudgey texture. 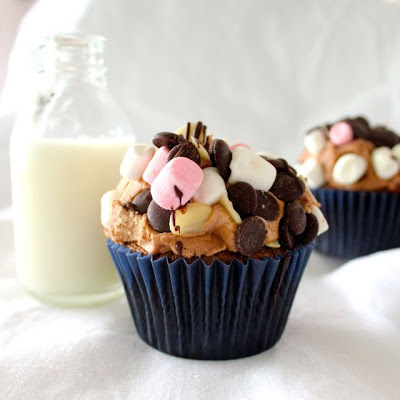 Spread onto the tops of the cooled cupcakes and press in your selection of toppings, mini-marshmallows, flaked almonds chocolate chips and a drizzle of melted white or dark chocolate to finish. My two kids request hot chocolate just so they get the marshmallows to go with it. They would go crazy for these cupcakes. Mmmmmm this is evil genius baking indeed. Love the rocky road cupcakes. Not sure that chocolate fudge icing would ever make it further than the spoon though. Yum! Oh these might be brilliant for my son’s 5th birthday in as couple of weeks. He loves chocolate so much and all the toppings as well as icing would go down really well. That’s one thing sorted! They know what they like Kristin, and who are we to stand in their way. 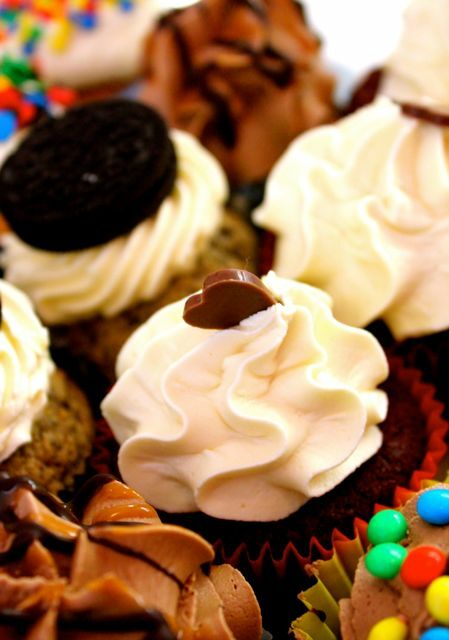 Your cupcakes look amazing. We are great fans of the cupcake, in our house, so these would go down well! I must remember to check out The Cupcake Bakery the next time I’m in Galway. Its 8:30pm and i have just stumbled across this delicious receipt. Down to the supermarket i go to get the ingredients and get at it!….Looks like I’m in for a long night. CANT WAIT!